With the importance of 'catch & release' well and truly embedded and adhered to by the vast majority of Scottish salmon fishers these days it's obviously equally as important that salmon care is also considered. I'm a big fan of the McLean landing net and the sturdy durable way this net frame has been constructed. Others professional guides see this the same way so I'd say that this particular net is one of the most popular landing nets in Scotland at this time. It's just a pity that there wasn't as much thought given to the early mesh bags that were fitted to these lovely weigh scale net frames and describing the original large gauge mesh net bag as 'course' on fish would have been giving it a promotion! Thousands of these beautiful McLean landing nets were sold by tackle dealers with this original large gauge mesh which would more often than not inflict torn fins on a salmon through the lack of fin support and non thinking anglers lifting salmon to weigh them in the net without sensibly turning the salmon onto its back. As more and more fishers noticed this fin damage McLean made available a replacement mesh bag made out of small gauge rubberised mesh so fair play to them. I see now that the McLean salmon nets come fitted with these latest more 'salmon friendly' mesh bags. Many other manufacturers of salmon landing nets & their mesh bags haven't been as swift as our New Zealand friend McLean at adjusting to the 'catch & release' era but no doubt they will if they want to stay in business. A good mesh bag should have not only a fine gauge mesh but should also have a flat bottom mesh bag. If the mesh bag isn't designed that way the salmon remains in an upright swimming position when landed and will try to keep swimming which will do no favours for unhooking or protecting its flanks & fins from damage. A flat bottomed mesh bag will turn the salmon onto its side when lifted to the waterline which stabilises the fish for unhooking and for photographic purposes. Up until the 'catch & release' era and necessary changes to the fishing laws I personally used to love using a tailer and what a great landing tool it was as the salmon never ever saw it coming unlike a highly visible landing net. It was also easy to carry and once activated over the wrist of the salmon's tail the fish would of had to have dragged you into the river to have any chance of escape! I've an old Hardy tailer in the house that's got a polished silver bits on its shaft that was once black paint through years of effective riverbank use. 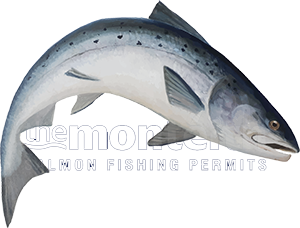 With your left hand lifting the rod high and good 'eye to eye' contact with your salmon at the critical landing moment the fish never saw your right hand and the wire loop tailer sliding over its tail! As a youngster fishing on the Tay whenever I got a chance the first and only landing method was the gaff. This was highly effective but lethal way of swiftly landing a salmon and especially a big fish which you'd maybe only get one chance at! All the Tay ghillies carried their own gaffs which could tell a few stories. I vividly recall in the mid 70's being out 'harling' in the Ferry Pool at Birnam with Tay ghillie legend Callum Gillies who had served much of his professional career on the famous Kinnaird beat of the Tay. The main topic of conversation from Callum was how many 'overly' heavyweight Kinnaird salmon had straightened his gaff over the years!